When I moved to San Francisco, several people informed me that I had to start reading The Fart Party. Like a lot of people, I was a bit put off by the title (and it didn't help matters that one of the first pages I read involved Julia Wertz decapitating a guy and then shitting down his neck hole), but I quickly fell in love with Wertz's no-nonsense art style and her foul-mouthed forthrightness. And it wasn't just me; amidst all the flashier comics on my shelves, The Fart Party is most frequently picked up and read by house guests. There has always been a teasing quality to The Fart Party, however. The books have been, in many ways, a character study of Wertz herself (or at least a study of the person Wertz thinks she is). Although there are snatches of the narrative of her life -- her relationship with her boyfriend Oliver and their subsequent breakup, her drug-addicted her brother, the food service jobs she picks up and quits -- they never quite rose to the level of memoir. 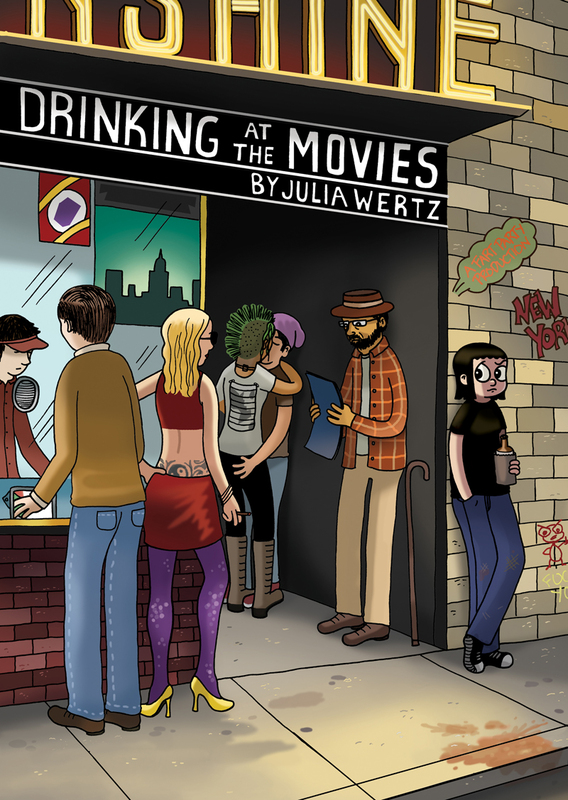 All that changes with Drinking at the Movies, Wertz's full-length, fully reflective graphic memoir. As soon as it opens, we know this is going to be a more dramatic and more thoughtful book than the first two Fart Party volumes. Wertz comes to at 3am the morning after her birthday in a laundromat, wearing her pajamas, eating Cracker Jacks, and wondering if she doesn't have a wee drinking problem. From there, we flash back to several months earlier, when Wertz decides to leave familiar San Francisco for the wilds of Brooklyn. The book chronicles Wertz's first year in Brooklyn, including coping with her brother's occasional overdoses, changing apartments as often as she changes jobs (which is to say, frequently), downing far too much whiskey, visiting family (and judging them), and being her usual charming self. With all that, Drinking at the Movies could have been a drearily serious work, but it's all done very much in the style of the previous Fart Party books, with the humor knife always pointed squarely at Wertz's own eye. She mocks her tendency to grumble about her brother's latest fall from the wagon while downing six-packs of beer. When she gets herself fired from one of her better jobs, you don't have to slap your palm against your face because she's already done it for you. She still jokes about her misanthropic tendencies and her favorite low-brow forms of entertainment. But she also captures something magical about being a 20-something urbanite responsible for no one but herself. The title comes from one of Wertz's favorite Brooklyn pastimes; when her apartment gets a bit too crowded, she indulges in boozy late-night trips to the movies, where she revels in being young, foolish, and alone. It's not a lifestyle Wertz can (or should) keep up forever, but it's one that has it's own simple delights. I've seen Drinking at the Movies described as a coming-of-age story, but Julia isn't quite an adult by the end. It ends at that moment before adulthood, when you start to sense that you need to make changes in your life, when you think you might someday soon become comfortable with yourself, when you find a place that's beginning to feel like home. It's still clear, though, that when Julia finally becomes a grown-up, her adulthood will still have plenty of poop jokes. Drinking at the Movies will be available August 31st, and you can pre-order it on Amazon . I am Glad i discovered this site.Added www.stormingthetower.com to my bookmark! She still jokes about her misanthropic tendencies and her favorite low-brow forms of entertainment.